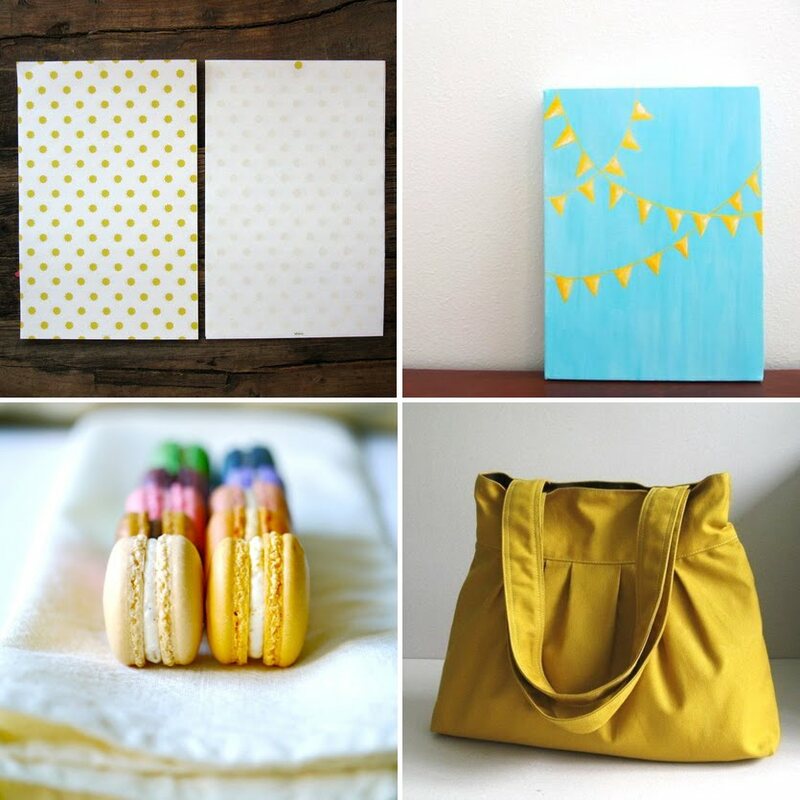 It's been overcast, with freezing rain here this week, so I thought I'd share these pops of cheery yellow from some talented artists. A few fun details: the polka dot stationery is actually a sweet little sun pattern, and the painting is by an artist from Hawaii found through my friend Tiffany. Also, those macarons (those macarons!) from this week's featured Etsy seller not only look great, but the shop owner's interview is just as sweet. Loved this quote, describing what handmade means to her: "There is a soul for every single handmade item; it has the crafter’s love, care and good wishes, yet you will never find two handmade items that are the same exactly." 1. weathered letters - studio of hearts. 2. garland painting - aisle to aloha. 3. french macarons - sparkles kitchen. 4. mustard bag - tippy thai. i just love the color! it is so happy and cheerful! that bag is my favorite!! so cute! Sending you some sunshine from Switzerland, we are having blue sky and sun already for the last days! Feels sooooo good! I cannot get enough of this color. Lovely finds. sweet finds. would you believe i've never had a macaron. What sweet yellow! Especially those macarons! I ate a raspberry macaron the size of my fist yesterday. It was from a local bakery and it was divine. Lovely, cheerful post, Alli! yayyy i LOVE lindsay's paintings!! they are adorable! and yum, i haven't had macarons in forever!! Just now seeing this! Thanks so much for featuring my painting! Aaaaand now I'm craving some rainbow colored macarons!